To check if a videopost node is enabled use !pvp->GetBit(BIT_VPDISABLED). Allocates a videopost. Destroy the allocated videopost with Free(). Use AutoAlloc to automate the allocation and destruction based on scope. [in] type The videopost ID. The allocated videopost, or nullptr if the allocation failed. 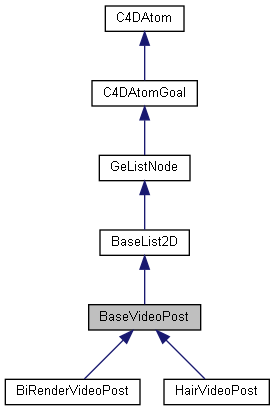 Destructs videoposts allocated with Alloc(). Use AutoAlloc to automate the allocation and destruction based on scope. [in] bl The videopost to destruct. If the pointer is nullptr nothing happens. The pointer is assigned nullptr afterwards. Gets the next videopost in the list. Convenience version of GeListNode::GetNext(). The next videopost, or nullptr if there is none. Cinema 4D owns the pointed videopost. Gets the previous videopost in the list. Convenience version of GeListNode::GetPred(). The previous videopost, or nullptr if there is none. Cinema 4D owns the pointed videopost. Merges stereoscopic images for rendering. [out] dest The destination bitmap to be filled with the merged stereoscopic image. The caller owns the pointed bitmap. [in] source An array containing the stereoscopic images. [in] cnt The number of stereoscopic images in source. [in] settings The stereoscopic render settings. See RDATA_STEREO. true if the stereo images were merged, otherwise false. Retrieves the number of stereoscopic editor cameras. [in] doc The current document. The caller owns the pointed document. [in] bd The current view. The caller owns the pointed view. The number of stereoscopic cameras. Retrieves the number of stereoscopic cameras used for rendering. [in] rd The current render settings. The caller owns the pointed render settings. Retrieves the information structure for a stereoscopic camera. [out] info Filled with the stereoscopic camera information. true if the stereoscopic camera information was retrieved, otherwise false. Checks if a videopost is available for a certain render engine. [in] id The ID of the render engine. true if the videopost is available for the specified render engine, otherwise false.